When I'd originally posted the tutorial on How to stop stumps from growing back, organically!, I'd made a promise - to come back to talk about how the process went and show the results. Well, here it is! The epsom salt method has been a complete success. I'm pleased to report that my "mother" orange tree is doing better than ever this year, and that the secondary tree that had been growing near the original stump is now just a hollow memory. During the first few weeks, the salts dissolved rather quickly. 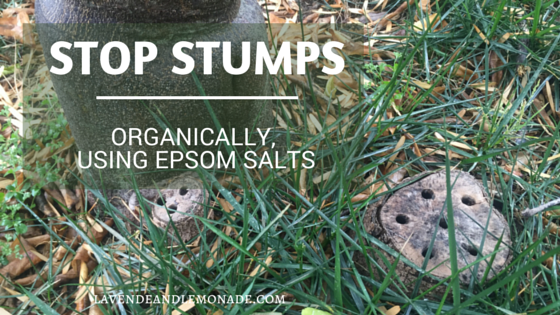 I checked in on my stumps weekly and refilled the holes with fresh epsom salts. Before long, the salts were lasting longer between refills and the stump was slowing its growth. In all, I probably refilled the salts around 5 times throughout the initial months. There were a few small shoots that tried to grow off the stump early on, which I simply broke off. By around month 4 it was clear that the stump was conquered. Now that a full year has passed, the stump is entirely dead and beginning to decompose. The drill holes in its surface are a nice reminder of the battle that has been won - organically - with the stump. I love that this method uses only Epsom Salts so is non-toxic, is effective, and takes just minutes of maintenance during the early weeks. Stock up on Epsom Salts HERE! 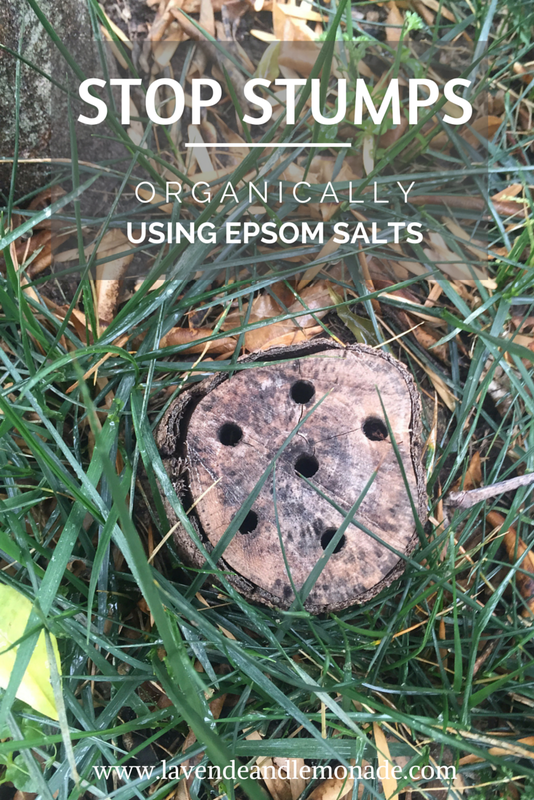 Epsom salts are not organic. Thanks for pointing that out. The salts themselves are a naturally occurring mineral, but the technique is considered a recommended method for organic gardeners. This technique was effective for stopping the regrowth - the little shoots that keep coming out of the stump as the tree tried to come back. The stump itself is still there, and nature is taking its course to let it decompose back into the soil - slowly but surely. Good luck to you! 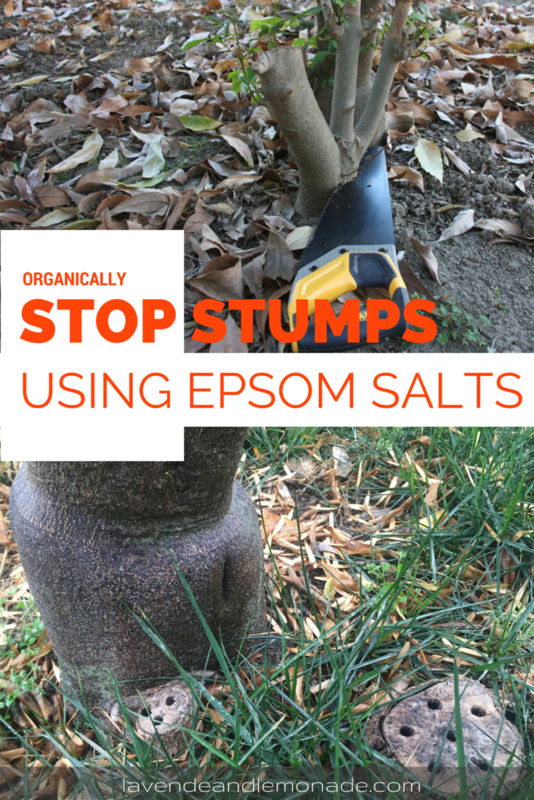 I love this idea of using Epsom salts for grinding away stumps. It sure would beat digging holes in your yard to find all the roots. If you have a really old tree, that could be a very problematic thing. When I picture that, I am seeing a whole renovation effort, just for a tree. That looks effective, but pretty intense! This technique works for stopping the growth, but the remains of the stump will take their natural course to decay...meaning it could take years for a giant stump like yours. Good luck!